Websitepulse is a web site that is a web server and website monitoring Service. 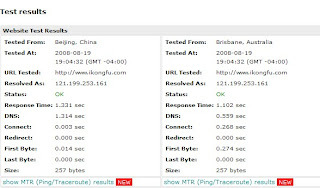 It is a commercial site but also has some useful test tool, includingwebsite test, DNS test, service test, and network test. 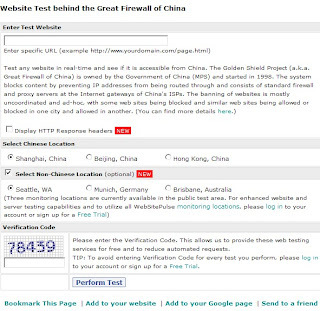 I was interesting about one tool which can test China firewall, because I am wondering if my site block in China, my Chinese friends complain about sometimes they can not see it. This tool lists three Chinese cities: Beijing, Shanghai, and Hong Kong. The good point is it also lists three other cities that outside China: Seattle (US), Munich, Germany, Brisbane, Australia. Just fill a web address into the bar, choose each city you want test, one is in China, another one in other country. After enter the Verification Code just click Perform Test button. After a while it will show you a result. Fortunately, my site is working in China.